Sous vide (SOO veed) is French for “under vacuum”, or the simple technique of cooking food sealed in a bag in a hot water bath. And recently, it’s being used more and more. You can control how your food comes out much more accurately with sous vide. Steak cooked to a certain temp in a waterbath will not overcook, and will be consistently the same color, texture and temperature throughout (as compared with grilled meats dry on the outside and juicy on the inside). With sous vide, once meat reaches the temp of its waterbath, it’s not going to keep cooking beyond what you want. American Chefs Thomas Keller and Grant Achatz are strong proponents of the technique, Keller so much so, that he came out with Under Pressure, a seminal book on the subject. I highly recommend this book, as it goes into every detail of the sous vide cooking method, including history, safety tips, best practices, methods and recipes. Many of the recipes I’m cooking from Achatz’ Alinea Restaurant cookbook include sous vide cooking, so I recently broke down and got the SousVide Supreme water oven and vacuum sealer package, and am loving it. Sure beats that pot o’ water! Here are some commercial sous vide cooking solutions out there now. I have not listed the DIY rigs you can make with a rice cooker, but those are still viable options if you just don’t want to spend the money on any of these. Turn-key sous vide solution. 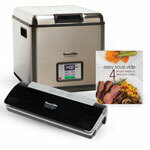 The SousVide Supreme “water oven” easily fits on a countertop, comes in two sizes: the SousVide Supreme, the SousVide Supreme Demi, and is available in several colors/finishes. Prices range from US$299.00 to $459.00. Stainless interior components are easy to remove and clean. Available in 8.7-liter and 10-liter capacities. 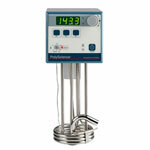 Compact and attractively designed, this thermal immersion circulator from CuisineTechnology.com sells for US$799.95. Second generation product is prettier than the original Sous Vide Thermal Circulator. Download a Sous Vide Temperature Reference Guide. Heats and circulates up to 8 gallons of water. Temperatures accurate to within 0.09°F (0.05°C). Not self-contained — you need a vessel (and lid) for your water bath. The original, laboratory-equipment design by PolyScience was adopted by chefs for sous vide cooking. An immersion circulator circulates the water. A thermal immersion circulator circulates and heats the liquid. 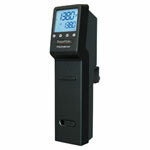 Still selling strong, this thermal immersion circulator from CuisineTechnology.com sells for US$1,022.00. Heats and circulates water in a bath. Available with a protective metal shield for circulator coils, and an optional hard carrying case. Circulator coils are exposed and may get dinged. Congrats on finally getting a SV rig Martin! It really is a fantastic cooking method. I really have to take issue with one point you made though. If anything, SV is NOT anything like “boil in the bag”. No Sous Vide cooking temp ever comes close to boiling temperature and it is much more about precise temperature control than anything else. I just hear that “well it’s like boil-in-bag isn’t it?” comment a lot and would hate to spread that notion to anyone who is reading this blog post. On another note, as much as I love Under Pressure, it is not for the newbie and focuses much more on high end recipes. I highly recommend Douglas Baldwin’s book Sous Vide for the Home Cook as an excellent and thorough book on the subject with. Also, the Sous Vide Dash app for the iPhone or iPad has been a great tool for cooking all kinds of meat cuts and their timing. Yes you’re absolutely correct, I oversimplified with a not-so-accurate analogy. Modern sous vide allows for exacting temperature control to get proper results. And that Sous Vide Dash app looks pretty handy! For circulator comparisons you may want to look at http://www.sousvidecooking.org/sous-vide-equipment-review-tests-123/sous-vide-chef-vs-sous-vide-professional-vac-star-vs-polyscience/ . Pros and Cons. Personally I am still for the PolyScience product – seems to be the professional choice (it’s the one I own and it has done a great job so fat). But the Vac Star unit may be ok for home use. Vac Star also came up with a Sous Vide App. Unfortunate naming. Wide ranges. Just intended for a general reference and to promote their product. I guess. Sous Vide ($1.99): Rather general information. A bit ugly and wide ranges. Great Sous Vide forum. Sous Vide Dash ($4.99): Great scientific app! Awesome for calculating core temperatures. Also pasteurizing temperatures. For circulator comparisons you may want to look at http://www.sousvidecooking.org/sous-vide-equipment-review-tests-123/sous-vide-chef-vs-sous-vide-professional-vac-star-vs-polyscience/ . Pros and Cons. Personally I am still for the PolyScience product – seems to be the professional choice (it’s the one I own and it has done a great job so far). But the Vac Star unit may be ok for home use.